Putting on an event or just want something differant for the office wall. 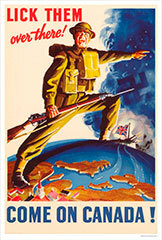 Here is our selection of reproduction posters from other Allied nations. A poster encouraging Canadians to give their support. 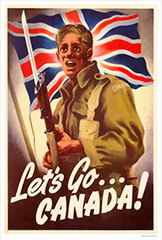 Another poster encouraging Canadians to give their full support to the war. Margie Stewert was the official US poster girl and featured on many posters. 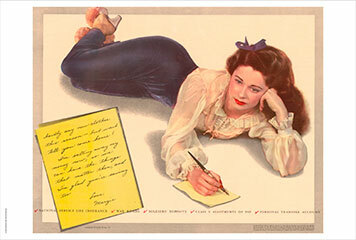 This example from 1945 promotes savings and shows her writing a letter to her sweetheart overseas. 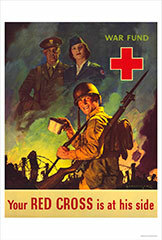 A US poster encouraging giving to the Red Cross. 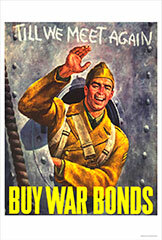 An iconic image on this US poster encouaging the purchase of War Bonds to help with the war effort. 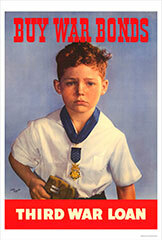 A hard hitting ipicture of a boy who has lost his father is the nducement from the US to encourage the buying War Bonds.